May 15 marks the possible 120th anniversary of clarinetist Jimmie O’Bryant’s birth, and May 20th will mark the 115th anniversary of pianist Jimmy Blythe’s birth. Both those musicians play on this record, so I can’t think of a better time to post it. Like a number of artists in his era and genre, details regarding the life and times of clarinetist Jimmie O’Bryant are few and far between, and the true birth date of the “mystery man of jazz” is uncertain, but when a date is ventured, it is most often cited as May 15, 1896. O’Bryant was born in either Louisville, Kentucky or somewhere in Arkansas. He took up the clarinet, playing in a style often compared to Johnny Dodds, and also played saxophone. In 1920 and ’21, he played with a band called the Tennesee Ten, and later worked with Jelly Roll Morton, King Oliver, and W.C. Handy. By the mid-1920s, O’Bryant was in Chicago, where he played with Lovie Austin’s Blues Serenaders and with his own washboard band, both producing records for Paramount. On Paramount, he was called “The Clarinet Wizard”. Jimmie O’Bryant’s promising career was cut short when he died of apparently unknown causes on June 24, 1928. Paramount 12287 was recorded in June of 1925 in Chicago, Illinois. The outstanding but minimal personnel features the likes Jimmie O’Bryant on clarinet, James Blythe on piano, and Jasper Taylor on washboard. This disc has a fairly serious crack about half way into the playing surface, but I’ve done my best to digitally remove all traces of the interruption. “Clarinet Get Away” has been cited as the earliest recorded track to use a riff resembling the one used in Joe Garland’s 1938 composition “In the Mood”, popularized by Glenn Miller and his Orchestra in 1939, which was in turn borrowed from Wingy Manone’s 1930 “Tar Paper Stomp”, but when I mentioned that tidbit on my YouTube upload of this tune, I get chewed out by a commenter calling it a “hoax” and saying that the recording “sounds very derivative”, so you be the judge. This is take 2, of two issued takes. 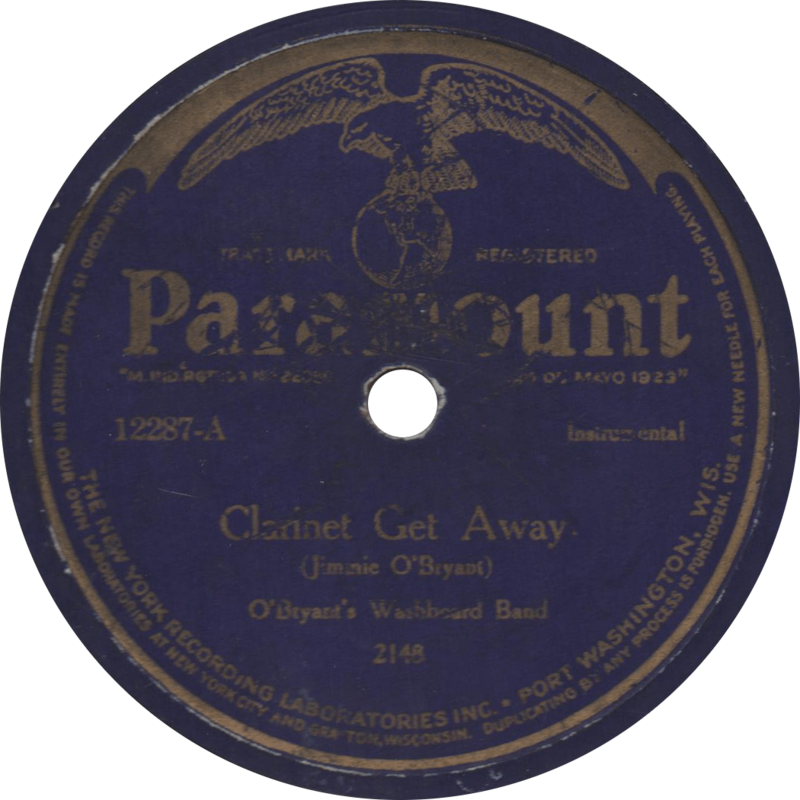 Clarinet Get Away, recorded June 1925 by O’Bryant’s Washboard Band. James Blythe’s composition “Back Alley Rub” is more of a slow drag, and for better or worse, sounds nothing like “In the Mood”. This one is also take 2. 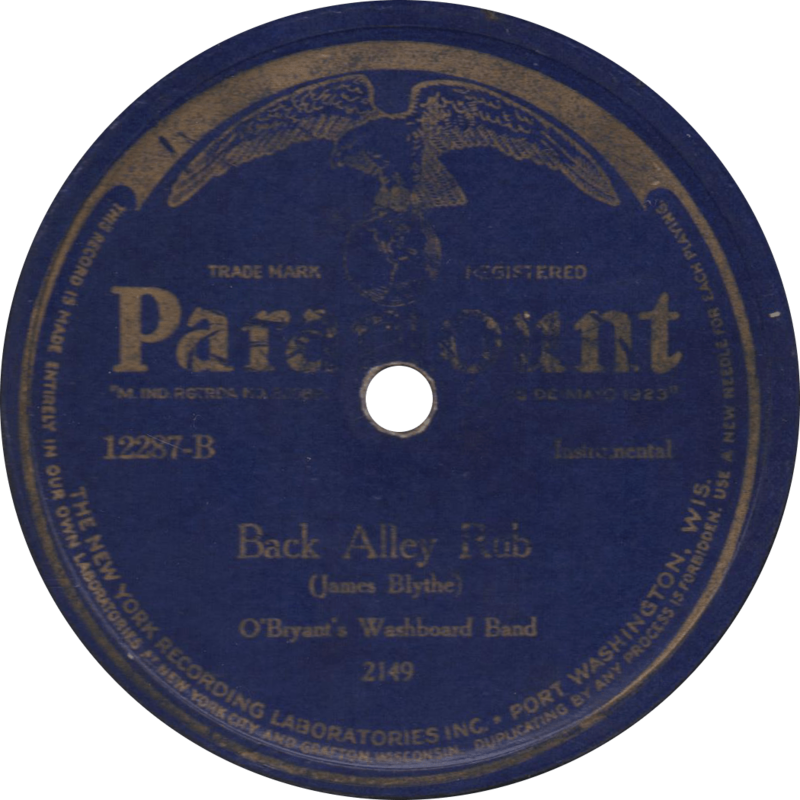 Back Alley Rub, recorded June 1925 by O’Bryant’s Washboard Band. Updated with improved audio on May 29, 2017. This entry was posted in Records and tagged 1920s, 1925, Blues, Chicago, James Blythe, Jasper Taylor, Jazz, Jimmie O'Bryant, NYRL, Paramount, Race Record by R. Connor Montgomery. Bookmark the permalink.